Thank you for using the GPM Corp application programming interface (“API”). Office of the National Coordinator for Health Information Technology (“ONC”). 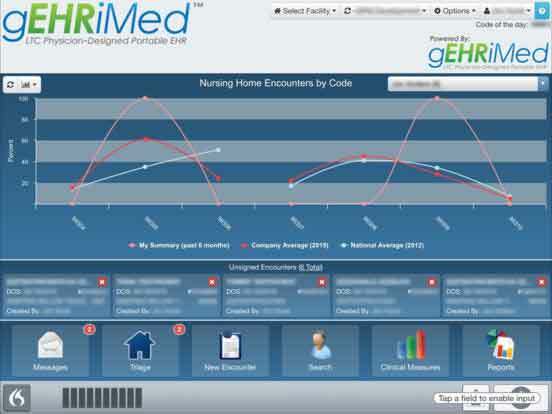 Pursuant to requirements set forth by the ONC for electronic health record (“EHR”) software to meet in order to be a certified EHR for the 2015 Edition Certification Criteria, GPM Corp has made available the GPM Corp API via this site to enable retrieval of patient information from the GPM Corp EHR. 2.1 Legal Age. You represent and warrant that You are of legal age to form a binding contract and that You possess the legal right and ability to agree to these Terms and to use the GPM Corp API in accordance with these Terms. 2.2 Accepting on behalf of Entity. If You are using the GPM Corp API on behalf of an entity, You represent and warrant that You have authority to bind that entity to the Terms and by accepting the Terms, You are doing so on behalf of that entity and all references to “You” and “Your” in the Terms refer to that entity. 3.1 GPM Corp API. GPM Corp may alter, rework, modify or update the GPM Corp API from time to time. GPM Corp will attempt to make, but cannot guarantee, future version(s) of the GPM Corp API that are backwards compatible with at least the most recent previous version. GPM Corp encourages You to adapt Your app to use the most up-to-date version of the GPM Corp API promptly following release by GPM Corp.
3.2 Terms. GPM Corp may change and update these Terms from time to time, and will publish any changes on this page. It is your responsibility to check this page for any updates. Your continued use of the API after any such changes constitutes Your acceptance of the new terms. If you are unable to comply with any amended version of the Terms, You are to stop use of the GPM Corp API immediately. 4.1 Compliance. You agree to comply with all applicable laws, rules and regulations relating to the use of the GPM Corp API. 4.2 Registration. You agree to register your app with an HCE that has implemented the GPM Corp API. You represent and warrant that the registration information You provide to HCE is accurate. 4.3. Your App. You represent and warrant that your app is stable. 4.4 Support. You agree to provide reliable and meaningful customer support for your app and to make it easy for customers to contact You with questions and concerns. 4.6 Business Associate Agreement. You agree to execute a subcontractor business associate agreement with GMP Corp.
IP Ownership. GPM Corp retains ownership of GPM Corp property and reserves all of its applicable rights with respect to the content of this site, GEHRIMED and the GPM Corp API. By using GPM Corp API, You do not acquire ownership of any rights in it or the content that is accessed through it. Nothing in these Terms shall convey any transfer of ownership of’ GPM Corp’s property. INDEMNIFICATION. YOU AGREE TO INDEMNIFY, DEFEND AND HOLD HARMLESS GPM CORP, ITS OFFICERS, DIRECTORS, EMPLOYEES, AGENTS, AFFILIATES, INFORMATION PROVIDERS AND SUPPLIERS FROM AND AGAINST ALL CLAIMS, LIABILITIES, LOSSES, EXPENSES, DAMAGES AND COSTS, INCLUDING REASONABLE ATTORNEYS’ FEES (“CLAIMS”), RESULTING FROM ANY VIOLATION OF THESE TERMS OR ANY CLAIMS ARISING FROM YOUR USE OF THE GPM CORP API OR THE GPM CORP WEB SITE (INCLUDING BUT NOT LIMITED TO INFRINGEMENT OF THIRD PARTIES’ INTELLECTUAL PROPERTY RIGHTS, MISAPPROPRIATION OF TRADE SECRETS OR OTHER PROPRIETARY RIGHTS OR NEGLIGENT OR WRONGFUL CONDUCT). DISCLAIMERS. THIS SITE AND THE GPM CORP API ARE PROVIDED ON AN “AS IS” AND “AS AVAILABLE” BASIS. YOU EXPRESSLY AGREE THAT USE OF THIS SITE AND/OR THE GPM CORP API IS AT YOUR SOLE RISK. TO THE FULLEST EXTENT PERMITTED BY LAW, GPM CORP AND ITS OFFICERS, DIRECTORS, EMPLOYEES, AGENTS, AFFILIATES, INFORMATION PROVIDERS AND SUPPLIERS DISCLAIM ALL WARRANTIES OF ANY KIND, WHETHER EXPRESS OR IMPLIED, INCLUDING WITHOUT LIMITATION ANY WARRANTY OF MERCHANTABILITY, FITNESS FOR A PARTICULAR PURPOSE, TITLE, OR NON-INFRINGEMENT. GPM CORP MAKES NO REPRESENTATIONS ABOUT THE SUITABILITY, RELIABILITY, AVAILABILITY, AND ACCURACY OF THE GPM CORP API OR OTHER INFORMATION, TECHNOLOGY, SOFTWARE, PRODUCTS, SERVICES AND RELATED GRAPHICS PROVIDED BY GPM CORP FOR ANY PURPOSE. Third-Party Content. The GPM Corp API may contain software, materials, content, data, or information provided, posted, or offered by third parties. You agree that neither GPM Corp nor its affiliates shall have any liability whatsoever to You for any such third-party software, materials, content, data, or information. Term and Termination. Either You, GPM Corp or the HCE may terminate Your right to use the GPM Corp API at any time, with or without cause or notice. Promotion and Advertising. You will not make any statement regarding your use of the GPM Corp API which suggests partnership with, sponsorship by, or endorsement by GPM Corp without GPM Corp’s written approval. Fees. Any fees applicable to Your access and use of GMP Corp API will be posted on gehrimed.com. Unique Agreements. GMP Corp may execute unique agreements or contracts with interested third party applications that use GMP Corp API. Applicable Law. These Terms shall be governed by and construed in accordance with the laws of Delaware without regard to its conflict of laws’ provisions. You consent to the personal and subject matter jurisdiction of the state and/or federal courts located in Delaware and waive (a) any objection to jurisdiction or venue, or (b) any defense claiming lack of jurisdiction or improper venue, in any action brought in such courts. 18.1 Captions. The captions of the paragraphs in these Terms are included only for Your convenience and shall not affect the meaning, construction, or effect hereof. 18.2 Survival. Any provision contained in these Terms which by its nature and effect is required to be observed, kept or performed after the termination of these Terms shall survive the termination of these Terms and remain binding upon and for the benefit of GMP Corp including, without limitation, the provisions set forth in Section 9, 10, 11 and 17 of these Terms. Any waiver or failure of GPM Corp to exercise promptly any right under these Terms will not create a continuing waiver or any expectation of non-enforcement.